Heavy-duty diesel vehicle regulations are regularly enforced on California roads. 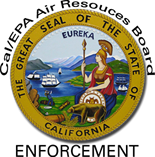 Learn more about California Air Resources Board's enforcement actions and inspection programs by viewing the penalties and sanctions, cases settled by ARB, and enforcement related web pages, inspection videos and press releases on this page. Civil penalties ranging from $300 to $10,000 per vehicle per day. Collection procedures with additional late fees and fines. Liens on real estate or personal property such as vehicles and other assets. ARB may obtain a judgment in superior court and can place liens on assets. A Department of Motor Vehicles (DMV) Vehicle License Title Stop (VLT). A DMV VLT Stop will prevent registration, renewal, or transfer of your vehicle(s). At the request of ARB, the California Highway Patrol may remove the vehicle in violation from service. ARB may file with the State Controller a request to offset any amount due a state agency from a person or entity, against any amount owing that person or entity by any state agency. Generally, ARB may file a tax offset request with the Franchise Tax Board for any amount owed due to unpaid violations. If you have received a citation, a notice will be mailed to you within 2-3 weeks. The letter will explain the necessary steps required to clear the citation. It is important that you follow the instructions provided to you to avoid any late penalties or further enforcement actions. If you have questions about the citation, please contact the appropriate number at the top right corner of the citation � in general, there will be a check mark next to the listed number. More information can also be found on the back of a citation regarding appeal deadlines and procedures.